Kitchen Transition: Chef de cuisine Justin Cherry enjoys a “second course” with chef Sean Brock, stepping over to McCrady’s Tavern after carving out his name in charcuterie at Husk. 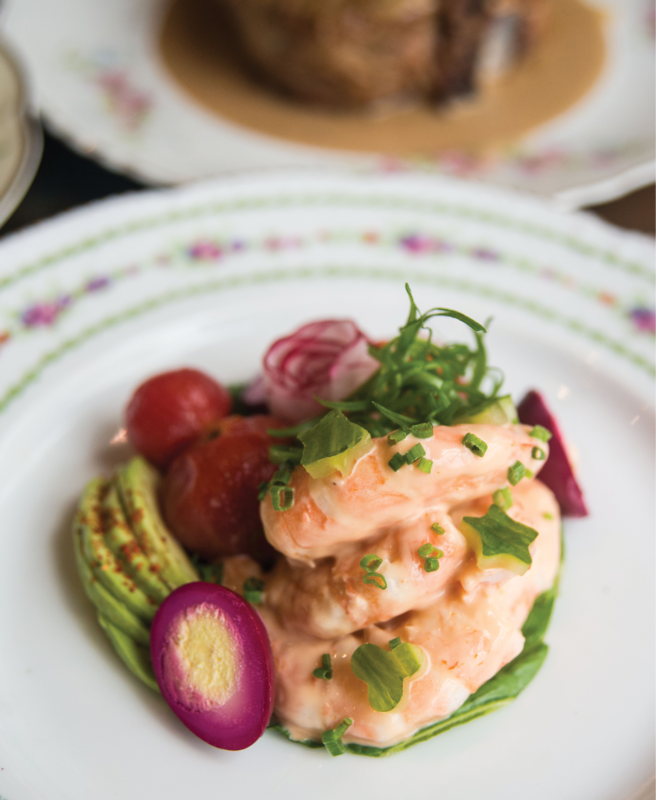 A kaleidoscope of flavors and colors characterizes McCrady’s Tavern’s dressed shrimp appetizer, which blends the creamy shellfish with beet-pickled quail egg, Espelette-spiked avocado, au natural tomatoes, and cucumber cutouts. Some Chops: Bathed in a classic French mustard sauce, the grilled pork porterhouse gets dressed with melted onions and a leafy herb salad. 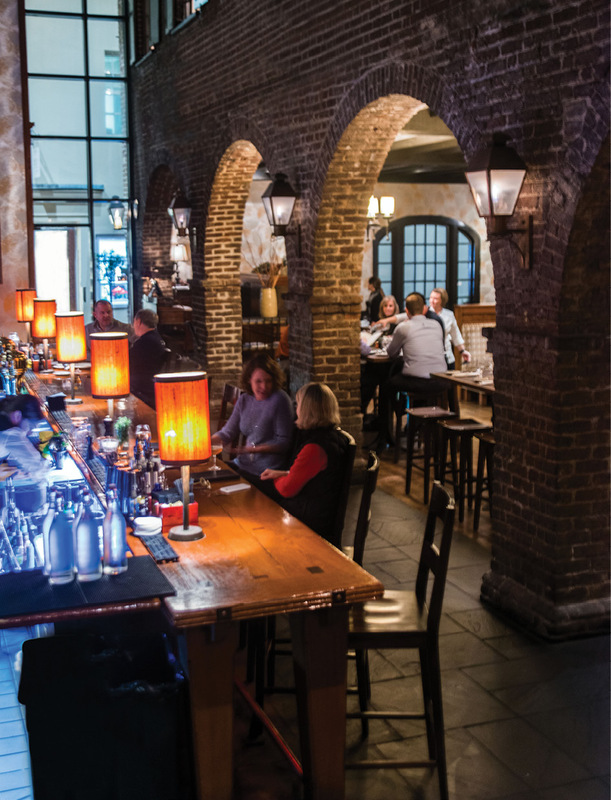 Casual Classic: Brick archways inside the historic building have shed their once-dramatic stained glass alcoves, bringing the former tavern closer to its relaxed roots. Suspended Animation: A soft-boiled egg afloat in a chicken-stock aspic gains playful panache from red-pepper diamonds and cucumber clubs in the oeufs en gelée appetizer. Change is never easy. Edward McCrady could have told you that. He happens to be my fifth-great-grandfather (but my affiliation with the restaurant McCrady’s ends there). He broke with convention, pursuing a Scottish lass across the Atlantic when her disapproving parents shipped her off. The young lovers eloped to the British colonies and settled in Charles Towne. McCrady built a tavern, sold wood to the Revolutionary Army, served grog and lager to dissidents, fathered a child out of wedlock, and was imprisoned by the British. He was, as far as anyone can tell, a complex man who plowed a singular path. So it seems entirely fitting that McCrady’s executive chef Sean Brock elected to shake things up just when we were all cozy and comfortable with the way things were. What does that mean? Well, for starters, it means more accessibility for us plebes, including the addition of lunch and brunch, plus (gasp) lower prices. The revamped tavern delivers a new mix, starting with its shuffling playlist of classic rock. Now, you are likely to hear the clanging intro to Pink Floyd’s “Time” as you dig into fiery stuffed clams or tap your feet to Ram Jam’s “Black Betty” as you savor a glorious mouthful of deviled eggs topped with house-cured ham and dusted with Espelette pepper. Out with formality, in with fun. Out with white tablecloths, in with high-backed booths and burnished copper tabletops. Gorgeous overhead beams remain (the building is, after all, on the National Historic Register), as do massive brick archways freed of the stained glass partitions that once divided the bar area from the room. I have read that as a society we no longer eat enough collagen in our diets, resulting in joint stiffness and more wrinkles as we age. If that is true, then McCrady’s Tavern should market itself as a health and beauty spa. Rich stocks and tasty fats infuse much of the menu. 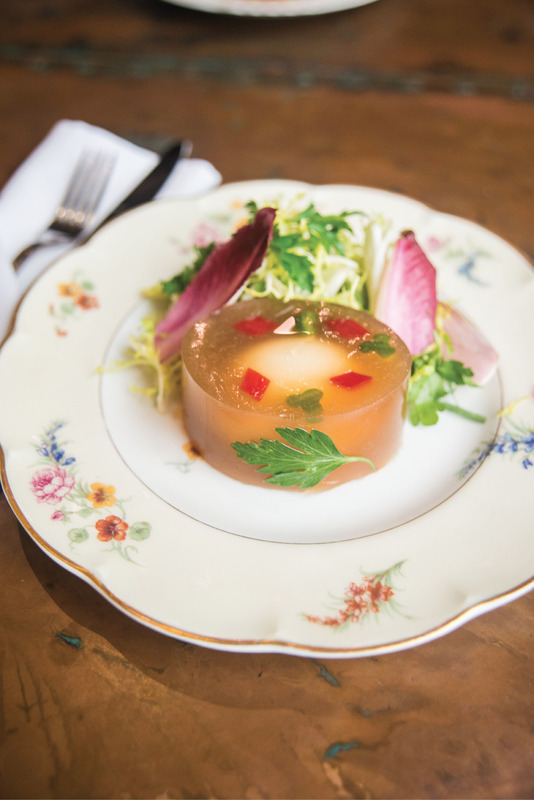 Chicken stock-based aspic with a hint of mushroom encases a delicately soft-boiled egg. Bone marrow transforms modest escargot into savory rockstars. A densely flavorful broth of calf’s head soup (an 1885 recipe, per the menu) pours tableside from an antique silver teapot into vintage porcelain, the liquid encircling yet another one-two punch of collagen-rich, creamy head cheese and an aspic-glazed egg yolk. 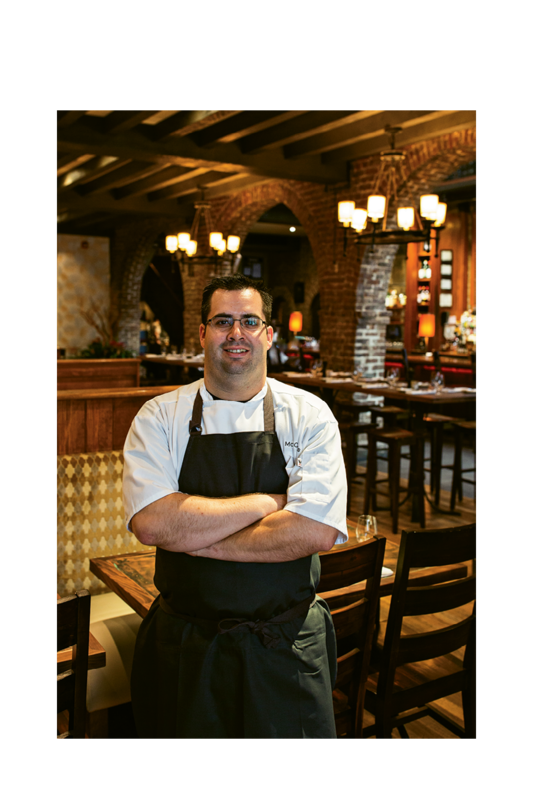 Clearly at play is Sean Brock, a multi-James Beard winner whose creative-obsessive culinary tinkering catapults classic dishes into an otherworldly sphere of decadent comfort. Nothing is as it seems. What appears to be melted cheese smothering “Oysters McCrady” is actually a complex glaçage of hollandaise, whipped cream, oyster liquor, and ham fat (thus its faintly smoky essence). Fries that accompany the much-talked-about béarnaise-oozing burger are not merely fries, but the love child of a three-way tryst among a tater tot, hash brown, and steak fry. Even the table butter is better than it has to be, whipped with nutritional yeast, sprinkled with locally made salt, then served room temperature, the better to easily slather over warm Normandy Farm fantan bread (heed my warning: it’s tempting to gorge on these rolls before your entrée arrives). My son’s roast chicken (yes, there is a kid’s menu that in itself would more than please the average foodie) came perfectly crispy outside and moist within, the result of a salting/aging kitchen technique that dries the skin, closes the pores, and locks in juices. My spaghetti dish really shone with plump and toothsome noodles dolloped with richly gooey burrata cheese, fresh shreds of basil, naked tomatoes, and snappy shrimp. If disappointment strikes, as it did for me on two dishes, reconsider your approach. Be sure to layer each forkful with all the elements on the plate. Case in point: the dressed shrimp appetizer. Alone, the creamy “Louie” dressing on the shrimp fails to pack a certain zing, yet when speared with an orb of its beet-pickled quail egg sidekick, the flavors together sing. Same goes for the classically French oeufs en gelée, in that the egg, aspic, and lettuce greens feel lackluster without the tiny bursts of bright orange, briny trout roe needed to complete each bite. 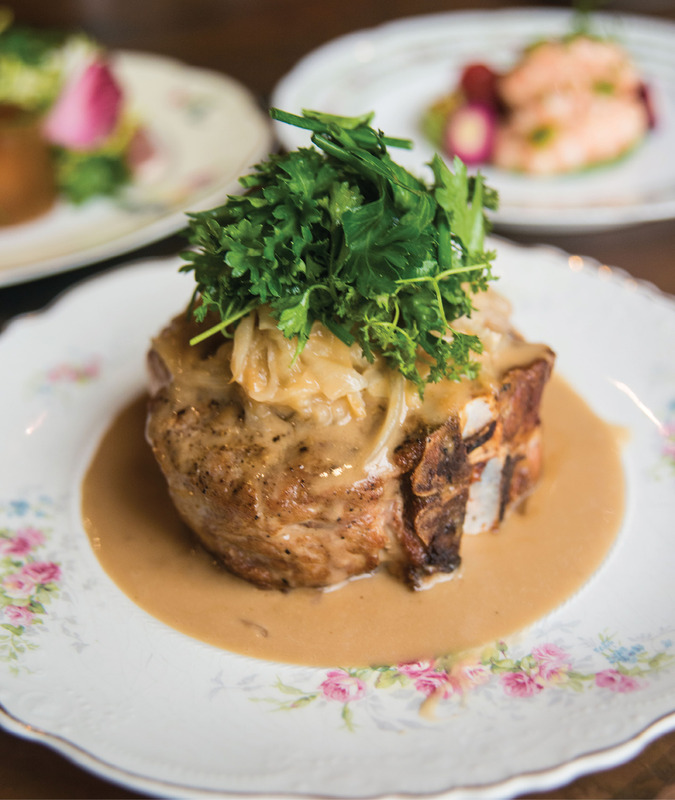 Some have deemed the music at McCrady’s Tavern too contemporary and boisterous for such a historic spot, and indeed one’s bone-marrow-escargot experience definitely shifts when Bad Company is crooning “Feel Like Makin’ Love.” Yet I flash back to March 2016, when Brock hosted guest chef Danny Bowien upstairs in the Long Room, where George Washington himself once dined. That evening, the Venetian chandelier glow was replaced by a gaudy pink. James Brown and LL Cool J’s funky bass lines reverberated through centuries-old brick as Brock and Bowien delivered platter after platter of spicy, tongue-tingling surprises, culminating in fireworks for dessert (literally: banana splits spiked with blazing sparklers). The event, a special dinner during Charleston Wine + Food, blew both the minds and palates of guests, who left with smiles plastered across their faces. Even Washington himself (his marble bust, anyway) hinted at a grin. In retrospect, the foreshadowing seems obvious. I’d like to think Edward McCrady himself would have enjoyed the hip, irreverent, and delicious changes to come. The Drawback: The contemporary playlist can be jarring and distracting to some.